Serial Report Chapter 80-Karl Dane, Lois Hall, Ruth Roland, Capt. Marvel. For most film buffs, the name Karl Dane brings to mind only the gangly, happy-go-lucky comic characters he played in silent films like “The Big Parade”. However, Dane started and ended his career portraying some unforgettable villains in serials. Karl Dane was born Rasmus Karl Therkelsen Gottlieb on October 12, 1886, in Copenhagen, Denmark. The son of a glovemaker who owned a toy theater, he grew up performing for family and friends, and this fueled his love for acting. Karl, along with his elder brother Reinald, was apprenticed as a machinist, and served a stint in the Danish Army, before his 1910 marriage to Carla Hagen. They had a son and daughter, Ejlert and Ingeborg. Due to high unemployment, Karl decided to immigrate to the U.S. and send for his family later. Arriving at Ellis Island on February 11, 1916, with no English skills and a mere $25, his powerful build helped him find immediate employment in a Brooklyn foundry, but Karl traveled around the country, briefly working as a car mechanic in Lincoln, Nebraska. Once back east, he was homesick and remembered his happy years performing, so he sought work as an extra in Fort Lee, NJ. His first film was for Vitagraph, but his part ended up on the cutting room floor. Karl persevered and soon won the plum role of the giant German Chancellor in the first Warner Bros. feature, “My Four Years in Germany”. Karl then left his card with director Joseph A. Golden, on which he had written a single word, “STUNTS.” As a result, Karl was offered the part of the chief henchman and stuntman in the Pathé serial, “The Wolves of Kultur”, also starring motorcycle daredevil Charles Hutchinson. Karl’s brutal portrayal and sheer physical prowess is startling to those not familiar with his versatility. In one scene, filmed at Ausable Chasm in upstate New York, Karl can be seen climbing down the bridge that spans the gorge. He also rides a motorbike and a horse, the latter on one occasion with the unconscious leading lady in his arms. After the success of “Wolves”, Karl again ‘villained’ in a number of other serials with Hutchison and Golden, among them “The Whirlwind” (‘19), now believed lost. By this time, he had split up from his wife who no longer wished to join him in the States, due to illness. Karl then met and married a Swedish émigré named Helen Benson, and since she strongly disapproved of his acting career they decided to move out west and take up poultry farming. In early 1921, they bought a parcel of land in Van Nuys, CA, and spent a happy two years. However, tragedy struck when Helen died in childbirth in August 1923, along with their baby girl. A grief-stricken Karl blundered into an unfortunate third marriage the next year, but this lasted only six months. 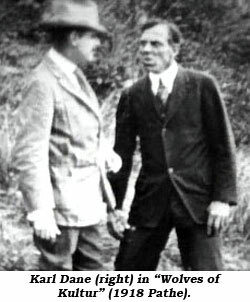 In early ‘24, Karl again met former co-star Charles Hutchison, who persuaded him to be a part of his new serial, the name of which is not known. Robert McIntyre, the MGM casting director and old acquaintance, saw Karl onscreen and recommended him to King Vidor, who was casting for “The Big Parade”. The rest is history. Karl was launched to stardom overnight; many more roles followed with luminaries such as Lillian Gish, Rudolph Valentino and Buster Keaton. He was also paired with George K. Arthur in a series of popular comedies. His future seemed assured. With the advent of talkies Karl’s accent was deemed a handicap, and eventually no studio would offer him work. 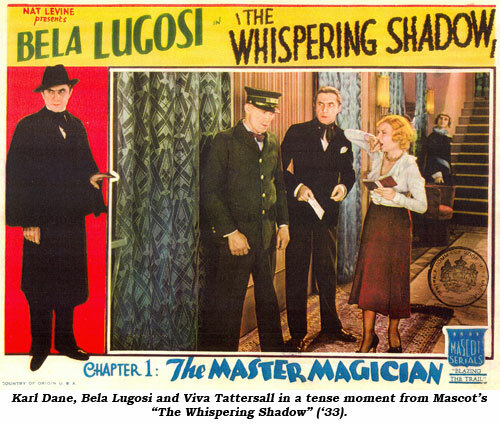 His last role was that of Sparks in Bela Lugosi’s Mascot serial “The Whispering Shadow” (‘33) when comic Harry Langdon had to drop out. After that, Karl was forced to look elsewhere for employment. He worked as a carpenter, mechanic, waiter, then a hot dog stand operator outside his old studio gates. None of these ventures were successful, leaving Karl broke and deeply depressed. Desperate, he begged his former MGM bosses for any job, even as a humble extra, but was refused. Literally down to his last dollar after he was pickpocketed, Karl shot himself the evening of April 14, 1934, in his small L.A. apartment. It was MGM, led by fellow Dane Jean Hersholt, who saved Karl from potter’s field when family in Denmark could not be located in time. He regained some of his former glory when he was buried at Hollywood Memorial Cemetery, now Hollywood Forever, in a service open to the public. A star was later placed on the Hollywood Walk of Fame to help rightly enshrine the Great Dane’s name and memory in the annals of film history. 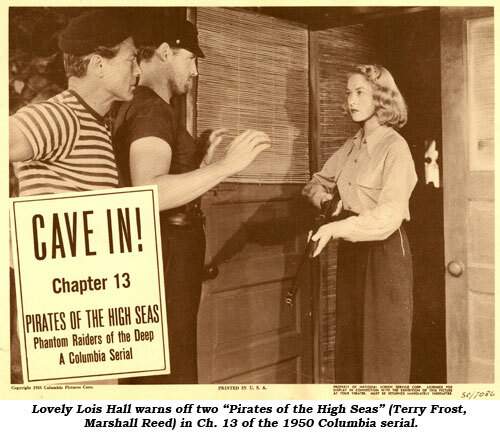 Lois Hall, co-star of Columbia’s “Pirates of the High Seas” and “Adventures of Sir Galahad”, died of a massive stroke/heart attack at her Beverly Hills, CA, home on December 21, 2006. She was 80. She’d been in New Orleans to work on Brad Pitt’s “The Curious Case of Benjamin Button” but was unable to continue due to illness and was sent home. Born in Grand Rapids, Minnesota, Lois actually grew up in much smaller Pengilly. The Depression brought the family to California in the ‘30s and after graduation Lois attended the Pasadena Playhouse. She made her screen debut in “Every Girl Should be Married” (‘48). She had the lead in “Daughter of the Jungle” at Republic, a film that recycled much serial footage. 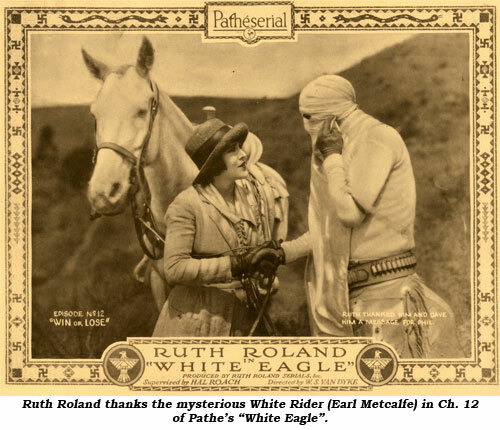 “White Eagle” (‘22 Pathé) was serial queen Ruth Roland’s 11th serial out of 13 total. A trident tattooed on her left palm proves Ruth is an Indian tribe’s Princess White Eagle, making that tribe heir to the Golden Pool, an inexhaustible supply of molten gold. Crooked Harry Girard, in league with the Buffalo Indian tribe led by Gray Wolf (Otto Lederer), who are after the gold, attempt over and over for 15 chapters to capture Ruth, but every time she escapes, often with the aid of a mysterious White Rider (Earl Metcalfe). Noted action director W. S. (Woody) Van Dyke (1889-1943) helmed this serial and others. At MGM he later went on to direct “Trader Horn” (‘31), “Tarzan the Ape Man” (‘32), several Thin Man mysteries and six of the eight Jeanette MacDonald/Nelson Eddy musicals. A devout Christian Scientist he refused all treatment as he was dying of cancer. He committed suicide to end his suffering. Actor/director Earl Metcalfe (1889-1928) is seldom remembered today. A handsome leading man in the teens he didn’t turn to Western/serials/action films til after 1922. He was later a heavy in “Eagle of the Night” (‘28 Pathé), an aviation serial during which he died in an accidental fall from a plane. Born in San Francisco in 1892, Ruth Roland entered the movies in 1910. From 1915-1923 she was the Queen of Silent Serials. Following her film career, married to acting coach Ben Bard, she became a multi-millionaire investing in real estate. She died of cancer in 1937. 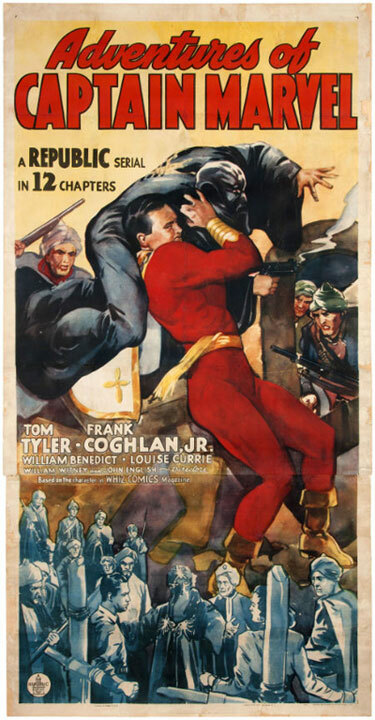 A three-sheet poster for “The Adventures of Captain Marvel” 1941 12 Chapter Republic serial starring Tom Tyler and Frank Coghlan Jr. sold at Hake’s auction in March for $1,875. Printed by Morgan Litho Corp. of Cleveland, OH.